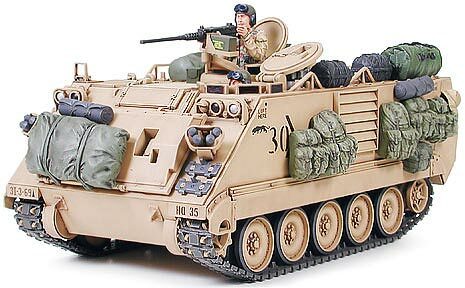 1/35 US M113A2 Armored Person Carrier Discounts Apply ! TAM35265 - 1/35 US M113A2 Armored Person Carrier - Desert Version. Tamiya presents a plastic assembly kit for the M113, a veteran Personnel Carrier that played an important role in the 2003 Iraq War. With the fear that important supplies would not reach the advancing U.S. personnel, the U.S. army called on the reliable and mobile M113. This detailed replica of the actual carrier also features extra attachments such as personnel equipment and ammunition cases. Of the various M113 type personnel carriers developed, the M113A2 began production in June 1979. Based on combat experience in Vietnam, this version was made with improved transmission, operating equipment and cooling system as well as reinforced suspension. Detachable fuel tanks were moved to the rear and external sides of the vehicle, smoke dischargers were mounted on the front, and the trim vane was enlarged. M113A2 units were deployed to the Gulf War in 1991, and in the 2003 Iraq War. The most recent M113A2 active in Iraq was also equipped with Combat Identification Panels (CIP), the latest friend and foe recognition device to prevent friendly attack. Large trim vane, smoke shell launcher, and external fuel tanks have been accurately replicated. CIP attached on both sides. Gun shield can be attached to M2 machine gun. Plenty of extra attachments including personnel equipment and ammo cases. Commander and driver figures included Decals for 3 different vehicles deployed to Iraq and one vehicle deployed to Bosnia-Herzegovina. Apart from decals for the vehicles deployed in the Iraq War, 1 set of decals for the NATO vehicle deployed to Bosnia-Herzegovina is also included in the kit. To accurately replicate the vehicle we recommend using Tamiya's NATO Green, NATO Brown and NATO Black colors.